This is one of the most easiest Diwali sweet prepared with maida. My mother had noted this recipe from a television show and asked me to try it. As it sounded very simple and needed very few ingredients, I tried it immediately. It turned out soft and delicious. Beginners and those who are pressed for time can try this easy maida cake. Today we will learn how to make maida burfi following this easy recipe with step wise pictures. Grease a baking tray or any plate with ghee and keep it ready. In a heavy bottomed tawa or non stick pan, heat ghee and fry the cashew nuts until golden brown. In the same ghee, fry maida on low flame for 5 minutes or until the rawness of the maida goes. Add food color, mix well and switch off the heat. In another pan/kadai dissolve sugar in 1/2 cup of water. Add vanilla essence. Boil sugar water until you get a one string consistency*. Then pour the sugar syrup to the maida mixture, stirring continuously. You can keep the pan on the kitchen counter and stir. It will start thickening. When it leaves the sides of the pan, pour the maida mixture into the prepared greased tray. Grease the bottom of a flat cup and press it evenly. When it is warm, make cuts with a knife across the burfi. Remove the pieces after it cools completely. Easy maida burfi is ready. Note - *What is one string consistency- Take little sugar syrup on a plate, when it is warm, touch the syrup with your forefinger. Press the syrup between your thumb and forefinger and pull apart gently, you should be able to see a single string/thread connecting both the fingers. This is one string consistency. Seive maida to get a nice texture. I forgot to do that. The texture was a bit rough on the outside but the inside was very soft and delicious. After adding sugar syrup to the maida mixture, stirring is done off the stove. 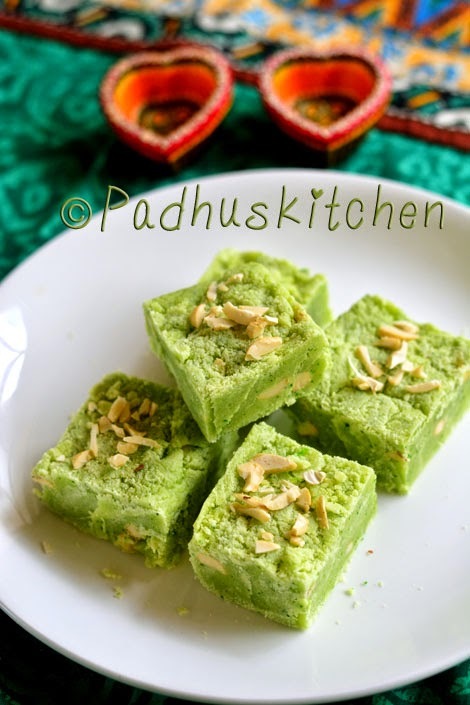 quick ,easy & delicious burfi.I really enjoy all ur receipes padhu dear. Thank you......we appreciate your effort & sharing with us! Hi Padhu, thanks for this easy recipe. I tried this today for diwali, and it came out very well. I have passed on the recipe to mom as well! You rock as always ! You must mix vigorously without stopping with one hand and add the boiling sugar syrup with the other hand which is a bit difficult. You need help. One person should mix continuously and the other person should pour the sugar syrup to the maida mixture. Shud the pieces be cut only when it is warm? I am planning to prepare multi colored one be preparing one after the other. Will it work?